I will be meeting for an hour with teens who are interested in writing... all questions answered! 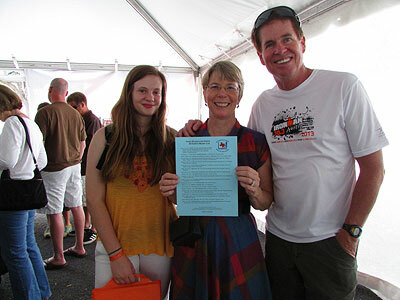 You do not need to live in Frisco to participate, but you do need to be a teen. More events will be posted soon; please check back! 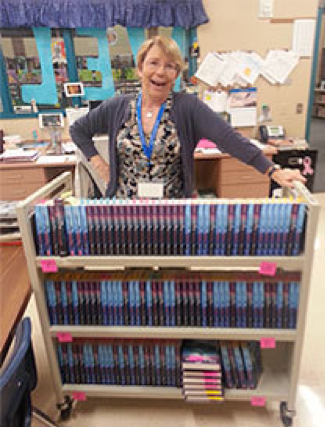 I was thrilled to learn that 6-8th graders in Florida voted The Neptune Project their favorite book on the Sunshine State Young Readers Award list this past year. 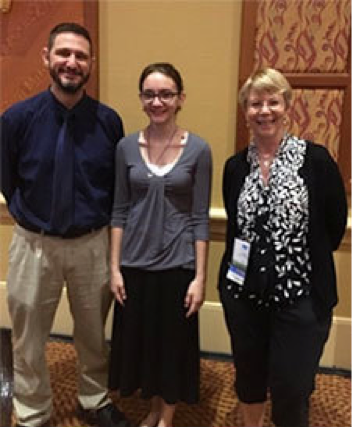 I enjoyed returning to the fun and fabulous annual FAME (Florida Association for Media in Education) Conference in Orlando to talk with school librarians and meet Keighley, a bright and talented Neptune fan, who presented me with my prize. 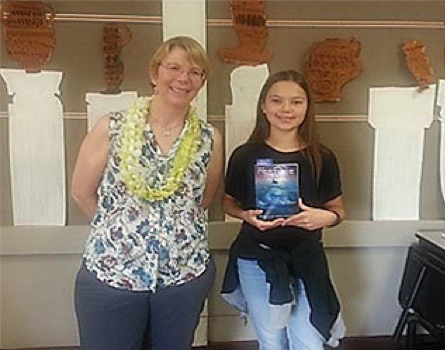 I was also pleased to learn that The Neptune Project was placed on Hawaii's Nene Children's Choice Award reading list. 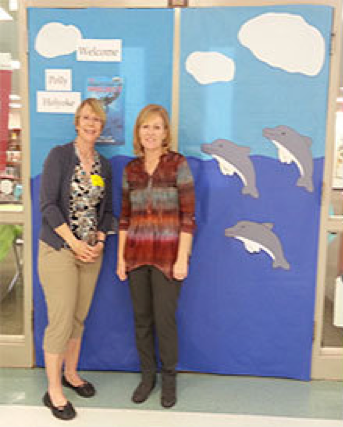 This past year I've enjoyed wonderful visits to schools on Kauai and the Big Island. 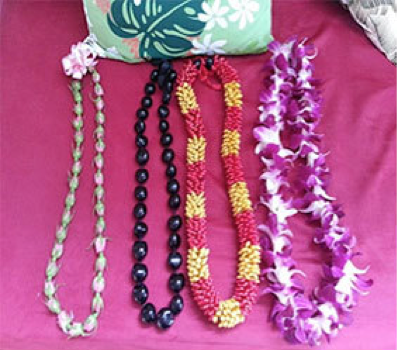 Teachers, librarians and students gave me the most beautiful leis! In January I look forward to visiting the Iolani School in Honolulu and public schools in Hilo and Kona. Brevard County schools invited me to be a part of a fascinating STEM day that librarian Ana Woodbrey and her colleagues organized for their middle schoolers. 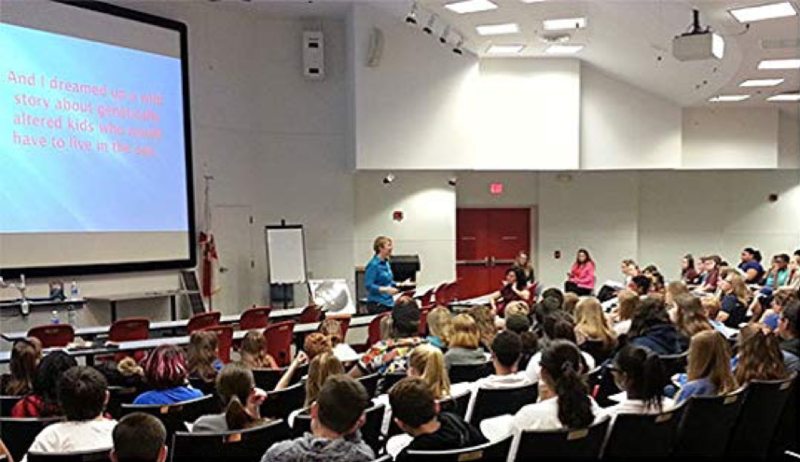 Two hundred students came from all over the county to Florida's Solar Energy to hear presentations on dolphin cognition, solar energy, and plastic pollution in our oceans. I spoke about some of the STEM topics in The Neptune Project including climate change, ocean issues and genetics. I visited over sixty schools in Texas, Florida and Hawaii last year where I was often greeted with wonderful decorations and cookies, and I signed lots of books! A former teacher, I teach practical writing workshops and give assemblies that get students excited about reading and writing. You can read more about my school visit programs on my website. 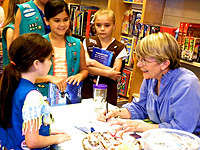 I continue to help Junior troops earn their Scribe Badge, and I help Seniors earn their Novelist Badge. I also give programs for entire Service Units. I'm in the local provider program guide for Northeast Texas or G. S. leaders may contact me at: neptuneproject1@aol.com. I'm going to take a break from my Neptune world, but I am planning to write the story of how Nere met her First Nation friend Tsukwani, and some day Bria and Robry may go off on adventures of their own. In the meantime, I'm revising a big middle grade fantasy series full of magic and adventure that I hope to sell to a publisher next year. The best way to see what I'm writing and releasing next is to visit my website. Aloha to all my new Hawaiian fans! I'm so pleased to announce that The Neptune Project was nominated for the Hawaiian Nēnē Young Readers Award. Since many of my dolphin characters are named for Hawaiian gods and goddesses, and since I did lots research for TNP on trips to Hawaii, being named to this particular state reading list means a great deal to me. 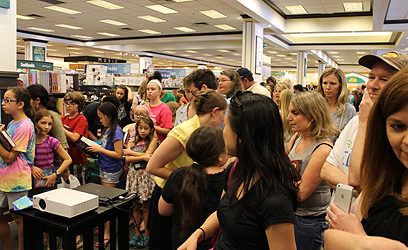 I had a great time participating in Barnes and Noble's national Teen Book Festival on June 11. Here I am at the Creekwalk Village store in Plano teaching a world building workshop to thirty-five keen and talented young science fiction and fantasy writers (with some help, most fittingly, from a storm trooper and C3P0 in the background)! 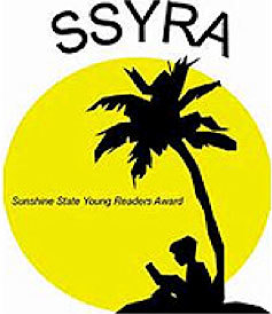 I'm delighted to announce that The Neptune Project has been nominated for the Sunshine State Young Readers' Award which means young people all over Florida are going to be reading about Nere's adventures under the sea! I'm excited to announced that The Neptune Challenge was recently short-listed for the Green Earth Book Awards because of the book's strong environmental message. 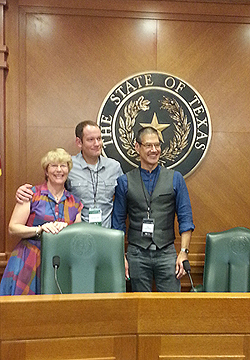 I was so excited to be on a panel at the Texas Book Festival this October with... Brandon Mull, and the talented Greg Leitich Smith moderated! 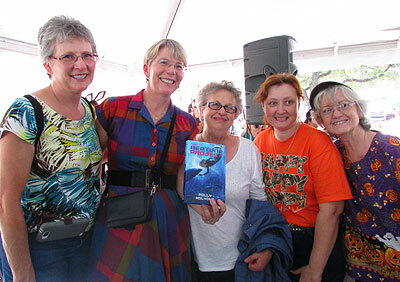 I was thrilled to learn that the AAAS (American Association for the Advancement of Science) selected The Neptune Project as a strong science-based read for young people. I also went on a fabulous trip to Canada and Alaska in August. 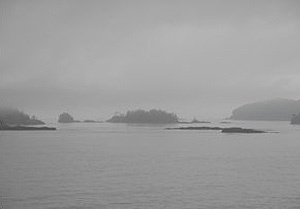 There I had a chance to see the Broughton Archipelago which is the location of Safety Harbor, my characters' fictional undersea colony. I also had a chance to do some great hands-on research, so to speak, at the Kodiak Fisheries Research Center. 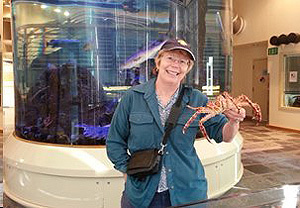 Here I am holding a little prince of a king crab. 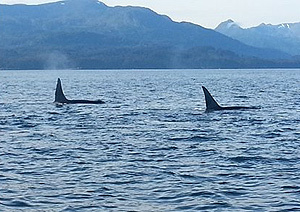 Some of my favorite moments on the trip included watching fin whales and this pod of orcas that swam by while I was supposed to be fishing. Suffice it to say, I almost dropped my fishing pole and dove for my camera instead! I was honored to be the keynote speaker at Texas Education Service Center Region 15's "Litera-sea" Conference June 15-16. I had a wonderful time sharing ideas with talented West Texas teachers on how to get students excited about their writing. 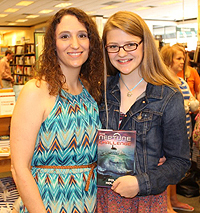 My launch party for The Neptune Challenge on May 16 at the Park and Preston Barnes and Noble in Plano was a blast. 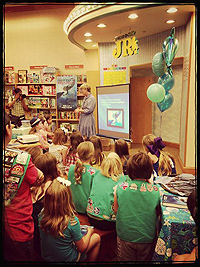 We had a great turn out with students and Girl Scout troops all over the Metroplex attending. 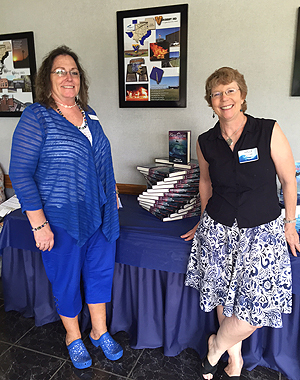 We sold 180 books and raised $500.00 for the Heritage Farmstead Museum. Thank you to all of the school librarians and GS leaders who helped to spread the word about this event. 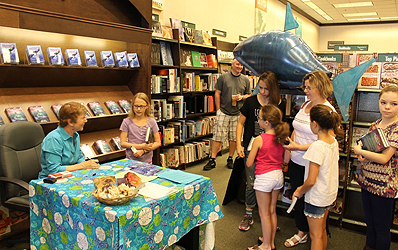 I'm so grateful to Warren Ayers and the rest of our patient Barnes and Noble staff for letting me hold my undersea carnival again. 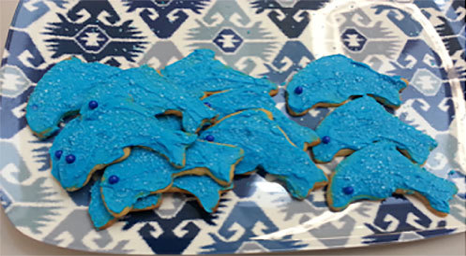 Here's a special shout out to my mother/daughter book club girls and to my family for running games like "Pin the Tail on the Dolphin" and "Fishing For Prizes." A whale of a time was had by all! Right: Sienna and her mom and grandma got the prize for traveling the longest distance (12 hours plus) from Nebraska to meet me! Below: The Crunch—the line almost ended up in Starbucks! I'm so pleased and honored that The Neptune Project was selected to the Texas Bluebonnet Award Master List for 2014-15. I'm very grateful to the hardworking librarians on the committee. I understand I will be traveling to lots of schools across Texas this next year, and that sounds wonderful! 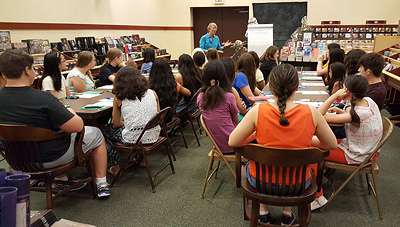 I love to teach writing workshops and to share my enthusiasm for writing with students. The following pictures from the Bluebonnet event were taken by Sophia Guzman. 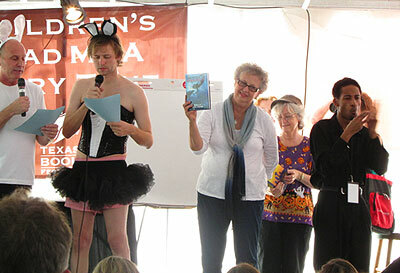 Here's the ACTUAL moment our wonderful emcees Jon Scieszka and Mac Barnett read out my title: The Neptune Project. It's official! My book is on the Bluebonnet list. Here's a beaming Polly with my daughter and proud hubby holding the 2014-15 Bluebonnet list. Here's Polly standing with some of my favorite librarians in the whole world: the hardworking members of the Bluebonnet selection committee. 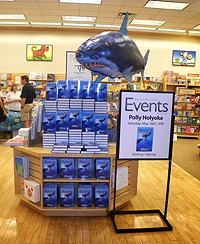 My debut book, The Neptune Project, is available from Disney/Hyperion in the US and Puffin Books in the UK. Read more about it here!